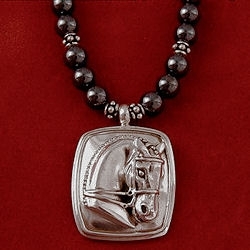 Classic sterling horse head on sterling square frame on 17″ hematite necklace with Bali silver spacer beads. 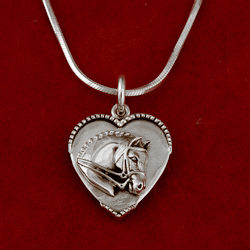 Pendant measures 7/8 inch wide by 1 inch long. Hematite is good for balance and wards off negativity. ****the exact Bali spacer beads shown are no longer available and will be replaced with a very similar style****. The closing is a substantial figure 8 lobster clasp that is easy to open. 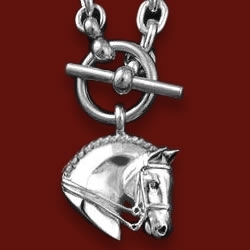 Classic sterling horse head on sterling square frame on 17″ hematite necklace with Bali silver spacer beads. 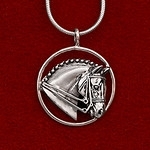 Pendant measures 7/8 inch wide by 1 inch long. Hematite is good for balance and wards off negativity. ****the exact Bali spacer beads shown are no longer available and will be replaced with a very similar style****. The closing is a substantial figure 8 lobster clasp that is easy to open. A unique piece!